« There are Geekier Geeks Than Me! This past weekend was a three-day weekend in Berlin (and, I suspect, most of Germany). Celebrating Whit Monday, this was the last legal holiday for Berlin until Reunification Day on October 3rd. I wish I could say that I did something awesome with my weekend. I cannot – I did see two movies: Boyhood (awesome and worth it) and X-men (fun, but I accidentally saw it in 3D, which was not fun). Most of my weekend time, to be blunt, was spent at home, with my windows shut, enjoying stale air. 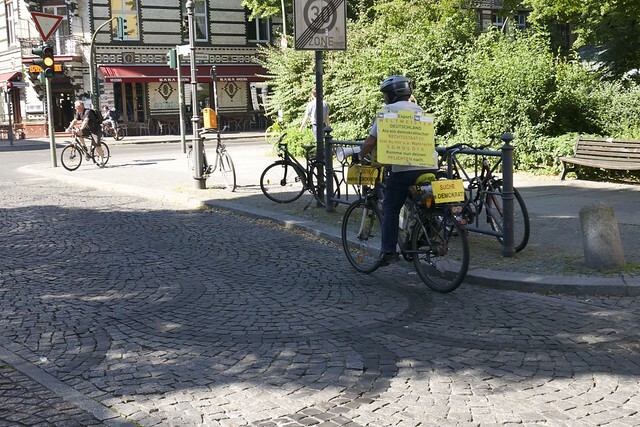 I’ve seen this guy all over Berlin, riding his bicycle, blowing his whistle, and ranting about the need for democracy. I finally took his photo Saturday. It’s not that I didn’t try going out, but going out was painful. Saturday, for example, I took an anti-allergy pill 30 minutes before leaving my apartment. Then, 90 minutes later, I needed to take another pill because I could not stop sneezing. 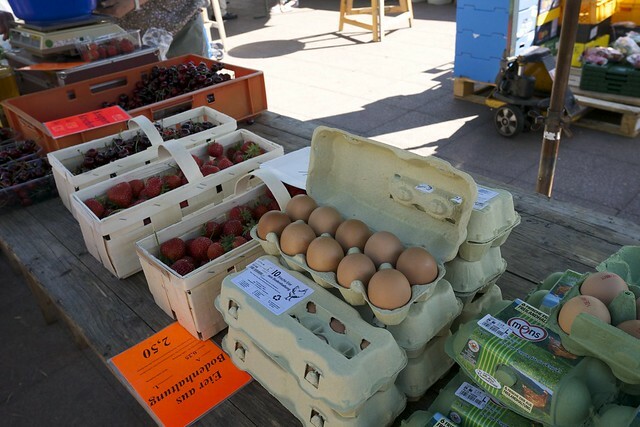 Fresh German eggs, strawberries, and cherries. This is why I love shopping at the Winterfeldtmarkt so much! Fortunately that cured me well enough that I was able to do some shopping at the Winterfeldmarkt on my way home, but as I noted last time, my anti-allergy pills put me to sleep. And sleep I did: long naps Saturday and Sunday. Long, solid, serious naps – with seriously strange dreams. Monday wasn’t that bad – I took allergy pills as a precaution. The good news, I guess, is that whatever I’m allergic too has (temporarily) stopped putting out pollen. I actually only took one pill today (sleepiness counteracted with a coffee). My lunchtime walk didn’t cause a single sneeze and I managed to make it home without an allergy attack, including a stop by my local supermarket. Side note: My local supermarket looked decimated. I was there around 3:30 this afternoon and the produce department looked sad and pathetic – nothing fresh to be had. I guess that the trucks were not rolling over the weekend. The rest of the store had a lot more gaps than normal – a few of the things I wanted to buy couldn’t be bought. Meanwhile I looked ahead on my June calendar – it’s Pride Month, with Berlin’s big Christopher Street Day parade on June 21st – this is an event worth attending just to see the amazing diversity of people (even though while I am a part of the community I am not really involved in the community). It’s also the same day as Fête de la Musique, the annual free music concerts all over the city bonanza that totally rocks. Every day is gay in Berlin. Why is it that some weekends there’s nothing that I want to do, while other weekends there are multiple things that I want to do? That said, June 21st is also the evening of the Germany:Ghana World Cup game – starting at 9pm. I have the vague feeling that the fun that is Fête de la Musique will be swept into the chaos and drunkenness that is Berlin when a World Cup match featuring Germany is in progress. I don’t plan on being out all evening. 4 comments to Berlin’s Hot! 97°F Hot! Thankfully it is not that hot here, yet. I feel for you, though. Hopefully it will cool down by the time you really want to spend time outdoors doing things. It cooled down today (Wednesday) with a hearty rain storm. I fear, though, that this will only lead to an allergy attack tomorrow or Friday. So, your allergy pills also cause a lapsus memoria or was going out for dinner with me part of a strange dream? Did I dream? Am I being put “back to the future”? Am I dreaming? What date is today? Marti….? ah… it was a memory lapse. It was a great evening, but it is also another example of me having to take two allergy pills in short order. So for those who are curious, AnkiH and I had dinner Saturday night at the Vietnamese vegetarian restaurant near my house — as always, excellent. We followed this up with Back to the Future, part 1. what a great movie!